Starscream has finally made it to American retail. He�s different for the experience compared to his Japanese counterpart. This is the third release of the mold overall, so if you want to read about it in detail, see the MP-3 and MP-5 reviews. Starscream comes packaged in robot mode. The mold hasn�t been altered, but the arms do move at the shoulder much more easily than the Takara versions (I suspect less-zealous springs). The colors are bright and catch the eyes, being fairly close to the original toy�s scheme. He�s not gray though, but rather near white. The plastics used for this release do seem quite a bit sturdier than the original Takara offering: quite resilient, and a specific weak point on the wing hinges is less apt to crack. 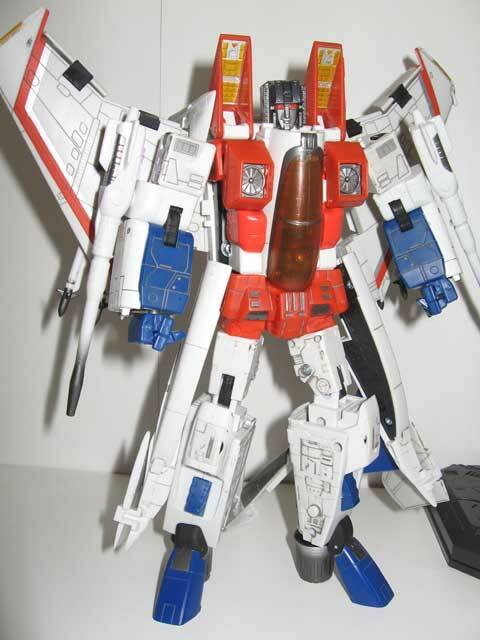 Starscream�s F15 mode amazes with its detail and design, but I can�t stand the colors. 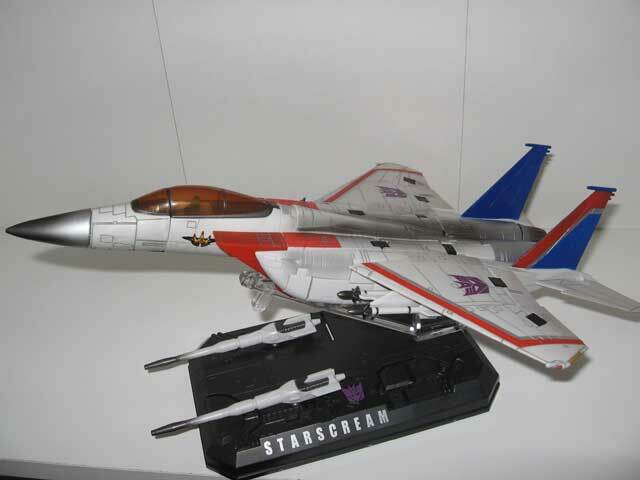 The beauty of the Takara Starscream was the use of muted colors to create a real plane�s paint scheme without sharp color contrasts of the original Starscream�s. Looking at the Takara plane from underneath, the colors don�t contrast so sharply, enhancing the disguise overall. With the Hasbro Starscream, the robot mode�s colors were emphasized to the point that the underside of the plane looks like half a rainbow threw up (I've included a photo of the underside to show what I mean). The splish-splotch of colors really undermines the amount of work and detail put into the plane to make it physically representative of a real F15. I do like the weathering effects, though. They portray Starscream as he would be in the middle of a dogfight or some such, even if it is just simple black airbrushing. The nosecone is actually blue underneath all the weathering paint, so if you�re so inclined, rubbing alcohol will clean it off. 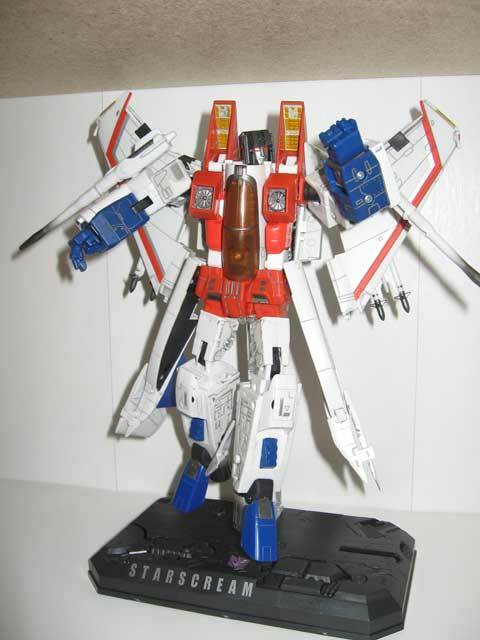 Starscream comes with the physical extras of his Takara counterpart: a display stand, an alternate set of missiles, and Dr. Archvile. The display stand can be used for either mode, and the mount can be stored underneath if you want to simply stand Starscream on top. It also has a place underneath to store the clip for Masterpiece Optimus Prime�s Megatron gun. The sticker sheet containing many optional plane designations was omitted. The real winner of the release is Dr. Archvile. Because Starscream is cast in white plastic, Dr. Archvile is as well. With a dot of peach paint on the face, he actually looks like a human instead of the green mutant included with the Takara counterpart. Transformation: 10. The Masterpiece Seeker mold is probably the best Transformer produced with the motif in mind: robots in disguise. As a plane, it�s almost indistinguishable from a model, and it yet it still manages to turn into a greatly detailed and well-articulated robot. For something as ultimately frivolous as a toy, it�s a masterwork. Durability: 8. I wouldn�t recommend dropping it to find out, but it does feature much-improved durability compared to the Takara version. Fun: 9. It�s not the sort of toy you can give to a child for rough-and-tumble play, but it is quite satisfying to fiddle with. Price: 10. $48.88 and a Walmart exclusive, which is half what importing the Takara version costs. Hasbro wins this fight! Overall: Difficult to say. 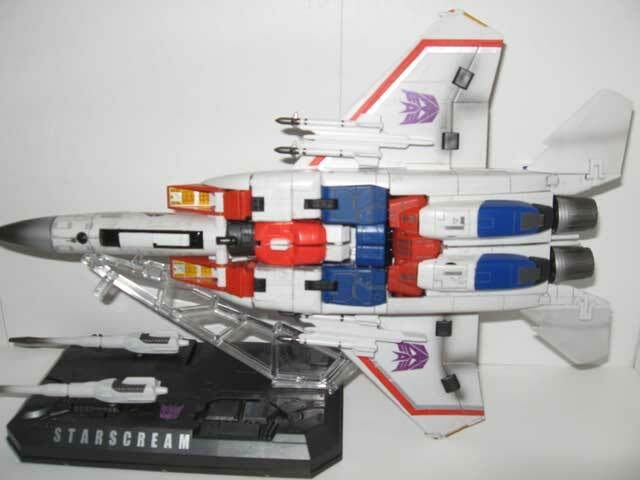 It�s improved from the Takara counterpart in terms of durability, and is roughly half the price, but I think Starscream�s plane�s colors are (and always have been) absolutely hideous, weathering or no. The robot mode isn�t so bad to look at, but I�m not convinced that�s enough to save it. If a Thundercracker is never made, I know which release I�m repainting, to put it that way.